Welcome to GREENFORCE JUICE, a conscious company committed to sharing clean, wholesome, organic, no hpp, kosher, vegan, and delicious living products that nourish the body with energy and health — from fresh-pressed juices, wholesome smoothies, organic açaí bowls, Rx juices, quick living shots to vegan soups and organic snacks. 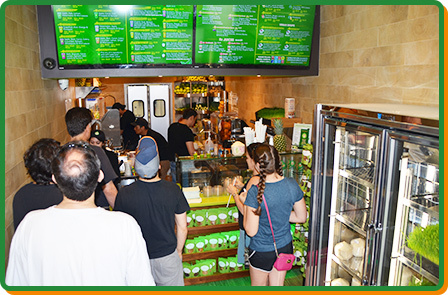 GREENFORCE JUICE crafts all fresh juices, smoothies, açai bowls, Rx juices (served hot), quick shots, vegan soups, organic snacks, superfoods, and innovative healthy creations! We’re also happy to offer the next new best thing you can have, Dr. Antibiotic — healthiness that includes orange juice, green tea, lemon juice, ginger, echinacea extract, cayenne pepper, and raw organic agave! Smoothies, bowls with organic granola, or just plain old raw organic fresh juice — our menu has something for everyone! Sounds too good to be true? Visit us to believe!